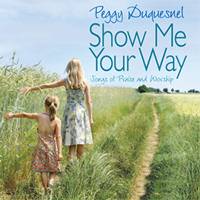 Show Me Your Way features a vibrant collection of original songs of praise and worship plus some popular hymns. The music reveals Peggy�s eclectic background in jazz, pop, Latin, gospel and the classics. Her unique blend of songwriting, piano improvisation and smooth vocals shine in both intimate and lively arrangements, featuring top-notch studio musicians and world-class background vocalists.